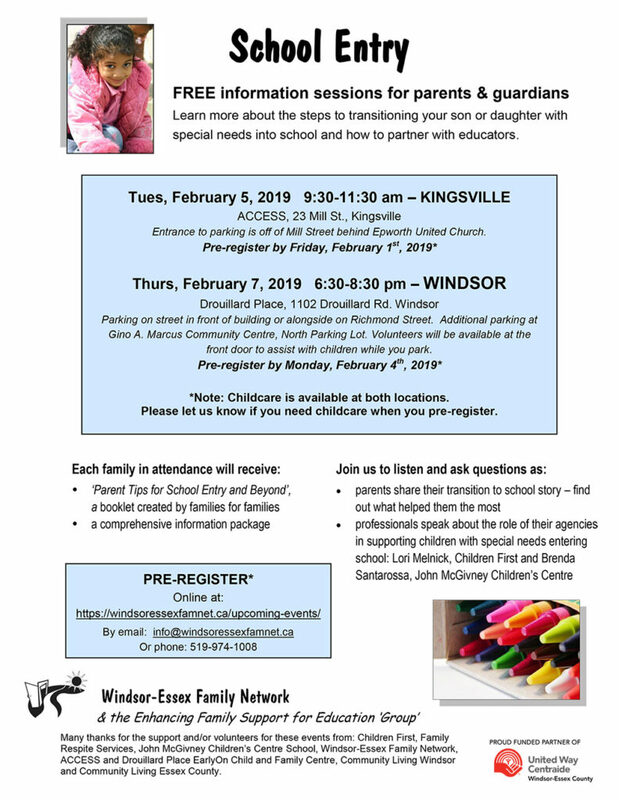 The School Entry events are for families who have children with special needs who are wanting to learn more about the transition process for entering school. This event has been helpful for families in the past who are not sure yet whether they want their child to start school. Or they are wanting to register their child, but are unsure of the process and the transition. The School Entry event is being held in two locations and at different times. It will be held in Kingsville at ACCESS on Tues. Feb. 5 from 9:30-11:30am, and in Windsor at Drouillard Place on Thurs. Feb. 7 from 6:30-8:30pm. Families who attend will receive a School Entry Booklet written and created by families, as well as an information package. They will also have time for asking questions and networking.